On the streets of Chicago or Denver during the summer months, one may suddenly see the huge, colorful chariots of Lord Krishna, slowly moving, swaying amidst a singing, drumming, and dancing crowd. It is a festival of Lord Krishna, celebrated all over India and, now, all over America. It is called the Ratha Yatra, literally, the “Chariot Journey,” of Lord Krishna, who is called Jagannatha, the “Lord of the Universe.” Also making the journey are Krishna’s sister Subhadra and his brother Balarama. The three chariots, with their large wooden wheels, are made by hand. The chariot, called a ratha, is really a temple on wheels, its tall spire made of bright red or green silk cloth stretched over a frame. Amidst the pillows and canopies below the spire sit the festival images of Lord Krishna and his entourage. In the Ratha Yatra, Lord Krishna leaves the temple to go out among the people on a journey, to encounter his devotees, not in the sanctuary, but in the city streets. His chariot is pulled by his devotees with long, thick ropes. Having a hand in pulling the Lord’s chariot is considered to be a joyful and meritorious exertion. And so it seems, as Krishna devotees join to pull the Lord’s chariot up Beacon Hill and past the statehouse in Boston, along Venice Beach in Los Angeles, along Devon Avenue in Chicago, or down Fifth Avenue in New York. In India, the great Jagannatha Festival of the Ratha Yatra is held in the town of Puri, on the west coast in the state of Orissa. The largest Krishna temple in all of India is there. 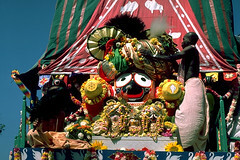 The image of Krishna as Jagannatha has a distinctive blockish shape, with enormous eyes, a smile, a crown, and garlands of flowers. According to legend, many ages ago, a king is said to have hired a craftsman to render the image of Krishna in wood. In his curiosity and eagerness, the king opened the door to see the image before it was finished, and Krishna came to life in the unfinished image. The large saucer-like eyes of Krishna are visible from a distance, all the better for the darshan, the “seeing,” of the Lord. Darshan means beholding with one’s own eyes the glory that is far beyond what the eye can see. Krishna makes this annual journey to meet his beloved Radha during the hot and rainy months of the summer. The divine love of Krishna and Radha is understood to be analogous to the love between God and each human being. This love, called bhakti, is not limited to a man or woman’s love of God, but is reciprocated by God, who loves in turn. In this journey by chariot, God initiates the movement toward humankind. The huge chariots that are pulled down the main street of Puri in the annual Jagannatha Festival roll toward Radha’s garden temple at the far end of the street, two miles away. After a few days together, Krishna will return to his temple. In Puri, the wheels of the huge chariots of the Jagannatha Festival are as much as ten feet high. Hundreds of worshippers lean into the ropes, and the chariot begins to move down the street along with hundreds of thousands of pilgrims. 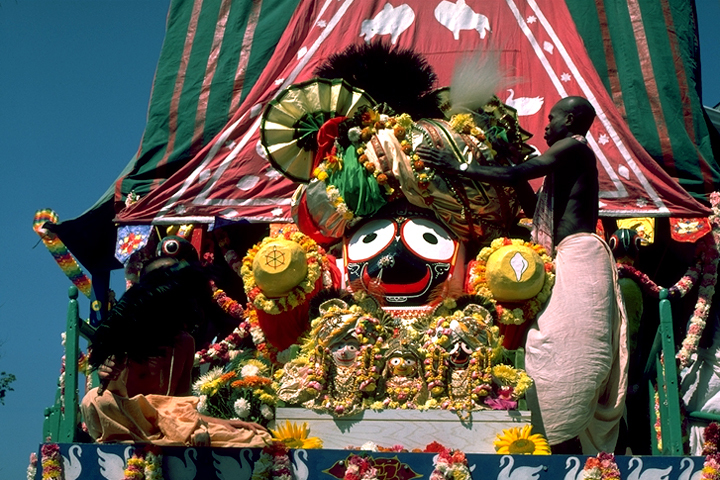 The Jagannatha Festival in Puri is truly one of the largest festivals in the world. The enormous chariot and the vast festival crowds astonished and probably frightened early Western travelers in India. The term juggernaut came into English from their reports, and it means an overwhelming momentum, crushing everything in its path. While the momentum of the huge wheels creaking on their axis is no-doubt apt, the spirit of the Jagannatha Festival is one of joy and devotion. America’s very first Festival of the Chariots took place in 1967 in San Francisco, when the first group of Krishna devotees decorated a flatbed truck with flowers and the images of the deities and made their way from Haight-Ashbury to the beach chanting “Hare Krishna! Hare Krishna!” They were students and followers of Swami A.C. Bhaktivedanta, the teacher who founded the International Society for Krishna Consciousness (ISKCON). 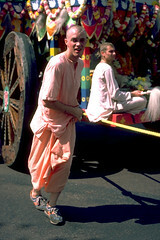 The next year, the devotees made a cart with silken canopies to shelter Krishna, and the procession moved through Golden Gate Park. In subsequent years, the carts grew into large chariots and the crowds grew to as many as twenty thousand. Today the Festival of the Chariots is an annual event in many American cities. The procession attracts thousands, as does the fair and the feast that follows. There are booths distributing vegetarian food and sweets, and booths with educational displays on the Bhagavad Gita or on reincarnation. ‘Hare Krishna!’ It brings out the best in people to see Lord Jagannatha smiling at them. by just a few moments’ association.